The new tile interface in Windows 8 has its fans, but if you don’t like it then it’s possible to completely get rid of it as of Windows 8.1. Step 1. Go to the Windows Store in the tile menu; a Windows 8.1 upgrade tile should appear. Step 2. If the tile doesn’t appear, install this update. Step 3. Return to the Store in the tile menu and install the Win 8.1 upgrade. Step 1. 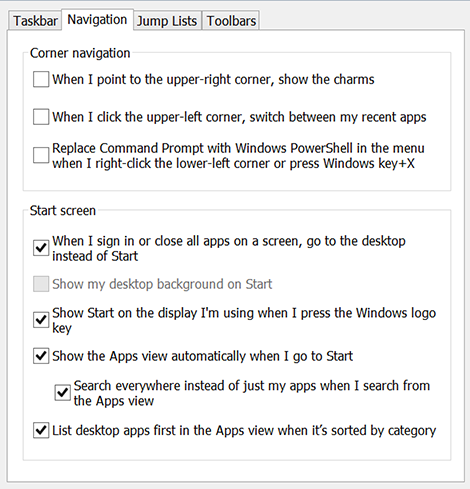 Right-click on the taskbar and choose Properties > Navigation. Step 3. Next, to restore the traditional Start Menu, install the Classic Shell utility. Step 4. Right-click the Start Button and choose Settings. In the Start Menu Settings tab, click Aero and Windows 7 style to get the familiar Win7 layout. Or customize to taste. Step 5. If the Start Button shows the Classic Shell logo, uncheck Replace Start Button to return to the regular Windows logo. having troubles with your RSS. I don’t understand the reason why I am unable to join it.